The following is what the Web Store looks like when a user clicks on the shirt graphic on the side rail. The list below outlines the various parts. A: If you accept credit card and have set up to process payments via PayPal or Authorize.net the credit card graphics appear here. You do NOT have to set up to accept credit cards to use the store, however. You should set up your credit card processing and be ready to go before attempting to use the store. In fact, TourneyCentral has a “safety switch” we need to turn on the back end, just to make sure no orders are processed prematurely. Setting up your merchant account is done internally by you, your tournament or your club. TourneyCentral does not set up PayPal nor do we handle your money. C: This is the description, pricing, quantity, sizing and color options. D: This is the cart. As the user adds various products in color and sizing options, it builds. 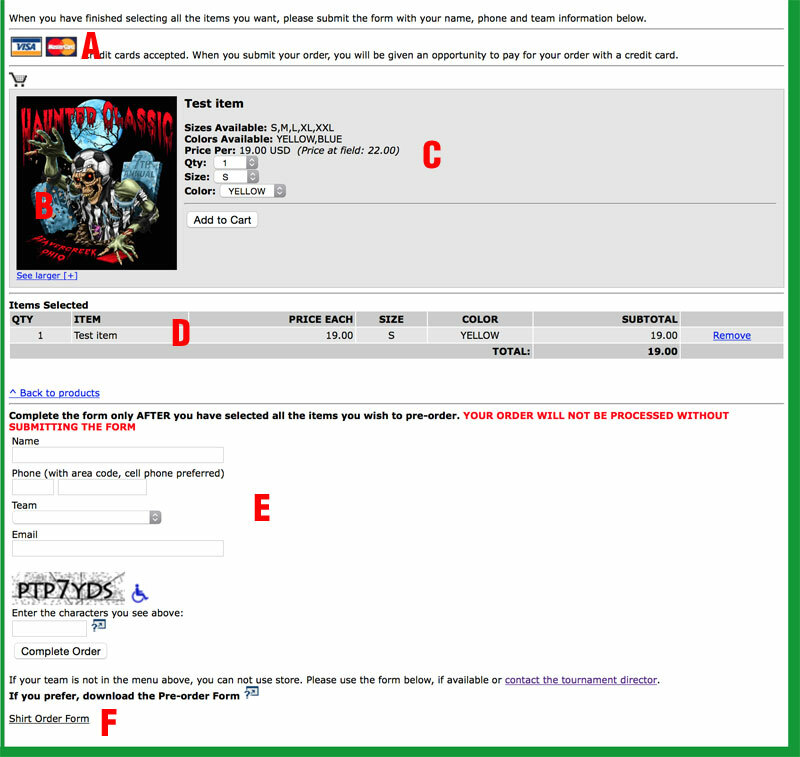 If the user enters in the wrong qty, size or color, they can delete it and re-add to the cart. E: This is the check out portion of the cart. This web store is limited to teams that have been accepted into your tournament. It is NOT a general public, full-featured cart. Therefore, only the teams that have been accepted will show up in the drop down. If the drop down is empty because you have not yet accepted teams, you may display the offerings, but teams will not be able to order. This is to prevent teams who have applied but may not have been accepted from ordering and paying, forcing refunds. F: Any forms or flyers that have been uploaded into the Website Maint Module>Forms>GO! area and flagged with the Tshirt flag will appear here. We strongly recommend that even if you are using the Web Store that you provide an order tally sheet and/or sample photos so the team rep can use to gather orders from the team at practice, etc. The system, however, will gather all the individual orders together and group by team even if entered singly by individual parents, rather than by a team rep.